From Old High German māno, from Proto-Germanic *mēnô. Cognate with German Mond, English moon, Icelandic máni, Gothic 𐌼𐌴𐌽𐌰 (mēna). From a conflation of Old High German māno (from Proto-Germanic *mēnô) and mānōd (from Proto-Germanic *mēnōþs), both from Proto-Indo-European *mḗh₁n̥s. Wa’ mer naachs em Bösch es, süht mer, wie hell der Mond schengk. When you’re in the forest at night, you see how bright the moon shines. Ich hann allt drei Mond nur der halve Luhn jekräje. I’ve been paid just half my salary for three months now. 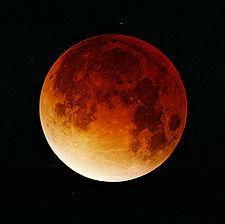 From Old High German māno, from Proto-Germanic *mēnô (whence also Dutch maan, English moon, Swedish måne, Icelandic máni). Ultimately from Proto-Indo-European *mḗh₁n̥s. See also Monat. This etymology is incomplete. You can help Wiktionary by elaborating on the origins of this term. 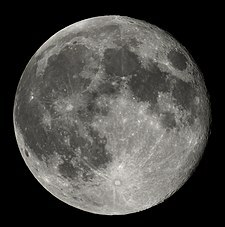 (astronomy) The Moon; Earth's only natural satellite, and also a luminary. Der Mond ist so massereich, dass Erde und Mond zusammen häufig als Doppelplanet bezeichnet werden. The Moon has such an enormous mass that Earth and Moon are often considered as a binary system. Ganymed ist der größte Mond des Sonnensystems. Ganymede is the biggest moon of the Solar System. Merkur und Venus haben keine natürlichen Monde. Mercury and Venus do not possess natural moons. Old Declension: This old declension is not used anymore, but was up until the end of the 18th century. From Old High German mund, from Proto-Germanic *munþaz. This page was last edited on 7 April 2019, at 05:44.